Hi there! This will be a very quick post ... I just wanted to let you know about the great offer they have at Crafty ribbons over the Easter break. If you order ribbons in total value £10 or more (excluding shipping), you will get a FREE spring ribbon bag with your order. 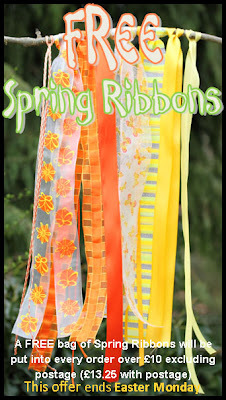 Below you can see the picture of spring ribbons. I think they are *gorgeous*.